Creel Cottage offers self-catering accommodation in the village of Balvicar reached by crossing the famous 'Bridge over the Atlantic' to the Isle of Seil, Argyll, in the West Highlands of Scotland. 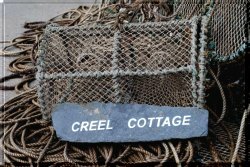 Creel Cottage is a family-run business comprising of a beautifully appointed self-catering cottage to rent on Seil Island, only a short drive along the A816 from the busy tourist town of Oban, the Gateway to the Isles. The property enjoys open rural views and the surrounding countryside and is next to Balvicar Bay, which has its own small fishing boats and yacht moorings. Balvicar lies on the Isle of Seil, about 14 miles south of the major West Coast town of Oban. The whole area is one of natural beauty and is perfect for sailors and golfers - and for those who just enjoy peace and quiet. The island is easily accessible being connected to the mainland by the famous 'Bridge over the Atlantic'. The bridge is approximately two miles from Balvicar at the village of Clachan where there is a pub, the 'Tigh an Truish', and a petrol station. Creel Cottage is in keeping with the area with its rows of traditional workers' cottages. Seil is one of the 'Slate Islands'. The slate mines closed in the 1800's. There is a small but interesting museum nearby, that described the workers' harsh lives. How to get here by road. How to get here by rail. How to get here by air.